As the focus of my work is emerging markets, I don’t spend a lot of time in the United States anymore, even though I grew up there. But like many people, I took a bit of time off this summer to enjoy a visit with family. We traveled to Mackinac Island in the state of Michigan, situated in Lake Huron. It was a unique experience for me in that it is the only island I’ve been on where there are no automobiles. The only transportation options are horse-and-buggy or bicycle. It really was like going back in time! While in North America, I also made a stop in Canada and sat down with one of my colleagues to record a podcast. We talked at length about a range of topics, including my childhood, my career, what I’m excited about today and why I never plan to retire! You can listen to the full podcast and read the transcript below. I encourage you to listen or read through to the end, as I answer a few questions that have been submitted to me via Twitter and LinkedIn. Maybe I’ve answered one of yours! One day, when I was a student at Syracuse University, I saw on the bulletin board: scholarships in Japan. I thought this was kind of intriguing. I got the scholarship and I studied Japanese and Japanese civilization. After six months I decided that’s going to be my career. I’m going to be spending my career in Asia. Sir John Templeton was quite a personality. The thing that impressed me the most about him was that, first of all, he was very frugal. He was very patient, very even-tempered. I never saw him get angry, lose his temper in any direction. I think the key to a successful career is that you’ve got to love what you’re doing. If you’re unhappy. Don’t do it. Get out and do something else. The other is to keep an open mind. Don’t make any conclusions until you have all the facts. Try to learn as much as you can and stay humble. Don’t try to draw conclusions based on your own opinions or your own biases. Be ready to accept new ideas. Five or 10 years from now, I think we are going to see consumer markets in emerging economies become bigger than what you see in Europe or in the United States. The most important thing, I think, is the youth. The populations in emerging markets are generally younger. People are getting married, buying houses, buying furniture. They are going to become big consumers going forward. If a country is going to grow, the resources in that economy have to be allocated by the market, not by the government. So that’s been the sea change that’s created a whole surge of growth in many emerging-market countries. The full transcript of the podcast follows below. Keith Damsell: Maybe we could talk a little bit about your family life and the background of your mother and father. It’s really interesting stuff. Mark Mobius: I come from a very international family in the sense that my father came from Germany, my mother came from Puerto Rico. So in my household, I heard German being spoken, I heard Spanish being spoken, and I ended up only learning English because my mother and father had to communicate with each other in English, basically. So, it was a quite interesting love story because my father and mother met in New York. I think they were both getting their citizenship and they had to go to school, and that’s probably how they got together. I was born in Bellmore, Long Island. Then after high school, I got a scholarship to study in Boston, Boston University and I started in fine arts. Mark Mobius: It was everything. It was art, it was music, it was drama… it was a full curriculum. I particularly liked the drama, that part of it. And in fact, for a while I worked at WGBH, the educational TV station in Boston. Keith Damsell: What were you doing at WGBH? Mark Mobius: Just, you know, the guy with the camera… cleaning up or doing things, you know. It was really funny, some of the things that happened. We used to play tricks on the guy doing the news because, usually, they just have a chest shot. And one day, what we did is we went up behind him and took his pants down while he was doing the news and because he couldn’t break, but we did a lot of hijinks like that. As my education progressed, I got more interested in psychology, social psychology, and ended up at the school of mass communications studying social psychology, and I got my master’s degree there. Then one day, I saw on the bulletin board: scholarships in Japan—Syracuse University offering scholarships. I thought this was kind of intriguing. First, I had to go to the map to find out where Japan was because, you know, geography is not one of the strong points of the educational system in the US. I got the scholarship, and I studied Japanese and Japanese civilization. And then, joined a whole group of people from different backgrounds. We stayed with families, and I stayed with the family in Kyoto, an insurance executive. That was quite an experience, living in a Japanese house sleeping on the tatami mat. So after six months I decided that’s going to be my career. I’m going to be spending my career in Asia. But there was an interim period where I could study at the University of New Mexico. Again, I studied experimental psychology there. We were running rats through mazes. They called us “the rat men,” because you know we had all these experiments. Then, I ended up in MIT [Massachusetts Institute of Technology] studying economic development and political science and economics. But, the emphasis was on economic development which was really timely when you look back because that’s where I ended up. Emerging markets is all about economic development and at that time, the professors were focused on trying to find reasons why countries grow. And eventually, the World Bank, the IFC [International Finance Corporation], USAID [United Sates Agency for International Development] ended up with a conclusion that the only way to make countries grow is by having them capture a market. In other words, have a market economy, rather than a socialist economy where the state determines the allocation of capital and resources. Then, I was sent to [South] Korea and I lived in Korea for about a year. Then, to Thailand another year and then Hong Kong, and I stayed in Hong Kong and started my own company. Mark Mobius: Survey research and industrial research. Keith Damsell: So in a sense, very similar to some of the on-the-ground investing research that you’re doing now? How did you shift from that kind of consumer research to the investing world? How did that happen? Mark Mobius: Well, in order to live. In order to survive. You know, this is the first time I had my own company. I knew absolutely nothing about business. You know, you study economics, you have no practical experience whatsoever. I really learned the hard way. And, of course, to survive you had to do anything that the client wanted. So I started getting these assignments, but the problem was—you know, when you’re a small organization like this you’re either selling or you are actually doing the research, and it was very difficult to build up a really continuous business. Then one day, a woman from California came to see me and said, “Look, I want to find manufacturers of toys.” She had the rights for the Peanuts characters—Snoopy and all the rest of those. She had been very lucky because Charles Schulz had given her the rights to almost everything because at that time, Peanuts was not that well-known. So she was starting to manufacture in Asia. And so she said, “Look, find manufacturers for us.” So we started finding manufacturers in Korea and other parts of Asia. I said, “Why not? They’re consumers.” So we started selling the Snoopy toys and that became a bigger business than the research business. We built that business up to be fairly big, and my Chinese staff and partners really were running that. I said, “Look, why don’t you take it over. I’m more interested in doing research.” And it just so happened that one of my clients asked me to do a study of the stock market. I had no idea what the stock market did. I mean, I’d done research for my thesis on COMSAT—Communications Satellite Corporation. But other than that, I really didn’t have much knowledge of what was happening in the stock market. But I started doing research and I did technical analysis and so forth, and I was pretty lucky because I predicted the fall of the Hong Kong market. So I said, “maybe I ought to look at this,” you know. So I saw an ad in the paper about this brokerage looking for research talent and I applied for a job, because I said, “Look, I’ve got to start from scratch. I’ll give my company to my Chinese compatriots and start this new area.” And I started with Vickers da Costa, which was one of the big brokerage companies in the UK at that time, but they were very big in Asia and in Japan in particular. And then, eventually, I was sent to Taiwan to open an office for the company. While I was with Vickers da Costa, I had been making presentations to clients and one of them was Templeton, Sir John. I went to the Bahamas a few times, and he came up with this emerging-markets idea, fund, emerging-markets fund, and he asked me to run it. And I told him, “Look, if you want to be in emerging markets, you’ve got to be in emerging markets. You should open an office in Hong Kong.” And that’s what we did. Keith Damsell: And at that time, the emerging markets, the universe was very, very small. Mark Mobius: At that time, we started in 1987 with 100 million [US] dollars with six markets that we could invest in. You must remember, all of Latin America was either socialist, dictatorship, closed to foreign investors. There was no Eastern Europe, the Iron Curtain. Asia, a lot of the countries were closed. China was completely closed. The Soviet Union was closed. There were few that were open for investment. So, we started investing in those six countries, five of them in Asia and one of them was Mexico and that’s where we started. Keith Damsell: Can you talk a little bit about working with Sir John and what that experience was like? Mark Mobius: Sir John was quite a personality. The thing that impressed me the most about him was that, first of all, he was very frugal. He was very patient, very even-tempered. I never saw him get angry, lose his temper in any direction. And very far-seeing. He always said to look five years at least into the future. And I remember when he was 70-something years old, he bought a whole warehouse of amethysts, which at that time were not worth much. Somebody asked him, “How long do you think it will take for this to increase in value?” He said about 20 years. This is when he was 70 years old! You know, and he did the same thing with property. He’d buy property and say, “Well, this will appreciate in about 30 years.” You know, that sort of thing. So he really had this belief that you had to take a long-range view. You’ve got to be patient. And of course, bargain hunting. He always said you’ve got to buy when everybody else is selling and sell when everybody else is buying. Keith Damsell: For you, as an investor, did Templeton’s philosophy kind of inform your thinking or did it, kind of, create a bit of a template, because you were already a global stock picker at that point? Mark Mobius: Well when I started, remember that I was limited to Taiwan and Hong Kong. We did some Asia, but, generally speaking, it was quite narrow. When they approached me in Taiwan, it was difficult to leave Taiwan. I was like a king there. I was the head of a single fund, no competition. You know, I’d arrive at my office, take my Chinese stamp, stamp the documents, sign them and go for lunch. I had a car and driver. The good old days. It was a great life. So, it was difficult to make that decision. Interesting enough, as you know, some people think that Sir John only focused on value i.e., cheap stocks, low P/E, low price-to-book, and so forth, but that was not really the case. One of the things he emphasized—and if you read anything about him—you’d find that, he emphasized flexibility. He said no one way of investing will always work. You’ve got to be willing to change and adjust. And unfortunately, a lot of times we didn’t pay attention to that. You know, just sticking to a value system, at least value in the way you think of it, you know, low P/E, low price-to-book and so forth, didn’t work all the time. And a good example was the Internet age resulted in companies with huge P/Es but performed very, very well. So it was a very important thing to remember that he was very flexible and open minded. Keith Damsell: So fast-forward for a little bit in your career. The last few years have been challenging returns for the emerging markets, and we’ve seen this dramatic shift in recent months where the returns are coming back very strongly. Can you talk about what’s fueling those gains in recent months? Mark Mobius: You know, that’s a very interesting point and it underlines the importance of being patient, because the three years up to January of last year, emerging markets underperformed the developed markets, particularly the US. So a lot of people abandoned emerging markets, but if they had waited for another year they would see a big surge. So if people had bought in when things were bad they would have done quite well now. In our own case, what we did is, we started looking at new industries, particularly Internet companies. Now in the past, we didn’t like a lot of the companies because they didn’t earn, they didn’t have any earnings. But now, they were companies that were earning. Their price/earnings ratios were high, but not that high, considering the growth rates. So we, you know, started investing in those companies and that helped us a lot. Also, we emphasize consumers because we’re finding that per-capita incomes in many of these countries is growing at a high rate. So we wanted to get exposure to the consumer market. And in addition to that, the small- and middle-cap [capitalization] companies were an area that we wanted to emphasize as well, because that’s where the consumer stocks were. Many of the large-cap stocks, you know, the banks, the commodity companies are big cap. But we wanted to get those consumer companies that tended to be small and middle cap. Keith Damsell: In these emerging markets, what is your five, 10-year forecast when you try and look to that growing middle class—some of those places where you’re investing now? Mark Mobius: Well, look five or 10 years from now, you’re going to see these consumer markets become bigger than what you see in Europe, in the US. Because look, China and India each have a billion people and their incomes are rising. And the most important thing, I think, is the youth. These populations in emerging markets are younger. I think the average age for emerging-market countries is in the 20s, for developed countries in the 40s. Now it’s true, at this stage, these 40-year old people, 50-year old people are rich so they spend more. But the emerging countries, young people are coming up, getting married, having houses, buying furniture. They are going to become big consumers going forward. I think emerging markets may be redefined to be called high-growth countries because that’s really what we’re looking at. Keith Damsell: Looking back on that 30-40 years, following emerging markets closely, there’s so many major events, many, many trends—the Berlin wall, the Asian Financial Crisis, 9/11 and continued conflict in the Middle East. What do you see as the biggest trends that have shaped that growth within the emerging markets that you’ve benefited from or the companies you’ve invested in have benefited from? Mark Mobius: A big trend has been the move towards a market economy. Because, as I mentioned, economists began to wake up to the reality that if a country is going to grow, the resources in that economy have to be allocated by the market, not by the government. So that’s been the sea change that’s created a whole surge of growth in these countries. Now, what does that mean? In order to have a market economy, you’ve got to have markets—stock markets, bond markets. In order to have stock and bond markets, you have to have companies that borrow and also that list, sell their shares. So you’ve had an incredible trend towards privatization of state-owned enterprises. That’s been a huge, huge change. If you look at the big companies in emerging markets, where the big ones are—former state-owned companies, even companies that are still majority controlled by the state, but are listed. In China, big companies are state owned, state controlled, state companies that have been privatized. So that is the big, big transition. Keith Damsell: You mentioned China, and so the state has a very active role, of course, in business. Do you think we’ll continue to see less government interference and market influences and factors growing within those parts of the world? I guess what I’m getting at is what is the role of the state, you think, going forward? Mark Mobius: That’s a good question because this is a big battle going on, even now. There has been, over the years, a tremendous resistance to the market economy idea. And there’s still a great belief, even in the US and Canada, that the government, the central bank, can solve problems. They can make [the] economy grow by lowering rates, interest rates, raising interest rates and manipulating the currency and so forth. Of course, the fact is that they cannot do that. You can’t grow unless you increase productivity. The way to increase productivity is by having a market economy. This is the reality. But there’s still a lot of resistance to that idea and you find that in emerging markets as well. A lot of countries resist privatization of state-owned enterprises because there are thousands of workers that could be put out of work because in privatization, efficiencies come in and people are let go, etc. A lot of the political elite have built their careers on handing out jobs to people in state-owned enterprises. So that battle is still raging around the world. It’s really a big issue, and it’s not completely clear what the outcome will be going forward. Keith Damsell: As an investor in China specifically though, is that challenging when you’ve got… “Okay, well our majority shareholder is the guys in Beijing. Well, I guess we’re going to do what they want to do.” How do you assess that kind of a risk? And they are now introducing corporate governance standards in these companies, which is quite gratifying because I think they realize, at the end of day, look if you’re going to have a market economy, you’ve got to spin off these companies. Keith Damsell: So that concludes our in-studio interview with Mark. He had to rush off to an investors’ meeting, but we will be reaching out to Mark via telephone to have him address a number of questions that we have received via social media from investors around the world. As promised, we have Mark on the phone now to answer some questions we’ve received from around the world that have come into Franklin Templeton via social media. So Mark, welcome. I have to ask you, where are you calling in from? Mark Mobius: I’m now at Mackinac Island in Michigan [in the United States]. It’s an island where there is no connection by bridge, so we had to take a boat here. It’s very, very unusual because it’s the only island that I’ve been on where there are no other automobiles—no motorized transport in any direction. Everybody has to get around by a horse-and-buggy and by bicycle. So, I’m only here for a few days more and then I have to go back to Hong Kong, so it’s quite an experience. Mark, I would love to know how it feels to be able to live free of borders and walking out of the house in a new place all the time. Does it get old and do you ever wish for stability and a simpler lifestyle? Or do you enjoy it still? Mark Mobius: First of all, thanks for that nice question. But you know, going from one border to the next, cutting through one border to the next, is not easy. You have to have your passport in order. Very often you have to have a visa. I have to carry two passports because my passports get filled up with visas and very often when I’m going from one place to another, I need to get a new visa for the next place I’m going to go. So, I send one passport off to the next embassy or next consulate to get a visa. So you know, going from one place to another is not without its paperwork and some hassle, but I never get tired of going into new places, experiencing new things, and also circling back on places I’ve already been. I mean, I’ve been to Rio de Janeiro many times. Buenos Aires, Argentina, Santiago, Peru, Mexico City in Mexico of course. Recently, I was in Panama, then South Africa and all of the countries in Africa like Ivory Coast, and you can imagine you know just the names give you some inkling of the incredible variety and change that’s taking place in these countries. And what impresses me the most is how things are changing, for the most part for the better with the age of the Internet, with smartphones. People are learning more and more about what’s happening and are able to make decisions much more quickly and effectively. And, generally speaking, it’s very, very exciting. I never tire of travel. Keith Damsell: Our next question we received via LinkedIn from Cyprus in the Mediterranean: What is the most difficult situation you’ve been in while traveling? 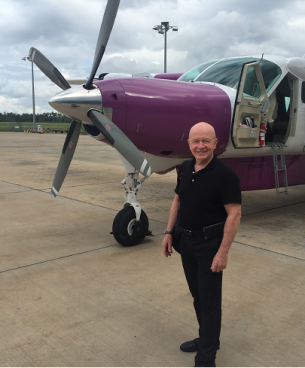 Mark Mobius: Probably the most difficult situation I’ve been when traveling was when I was in Russia and we were in Siberia. We were visiting companies and got stuck in a snowstorm. We couldn’t take off. We were going from the middle of Siberia to Moscow. And we were stuck there in that city and we had appointments waiting for us in Moscow. I mean, there are many instances I can give you, difficulties we had in traveling around the world, but that’s probably one of the most difficult because, as you know, the Russian winters in Siberia can be very extreme. And I remember in one instance, when we were traveling to Russia, as we were landing, the windshield of the plane broke. It didn’t of course break through completely, but it crackled, you know, how now the windshields can crackle but hold their strength. And that was pretty frightening at first, but we worked that out and then we were okay. So I would tell you those are the most difficult. But at same time, I can’t speak badly of Russia because some of the most wonderful experiences I had were in Russia, in places like St. Petersburg and Moscow and so forth. Keith Damsell: I have to ask a follow up question, so how did you get out of that snowstorm in Siberia? What happened? Mark Mobius: We just had to wait it out. We had to wait until this snowstorm died down and then we could take off, but we were still taking off in snow. And by the way, you know when you’re in a situation like that, they have to be very careful that the ice does not form on the wings. So before we took off, they had to spray the plane, and particularly on the wings, to prevent the ice from forming on the wings. So the first time it happened it was kind of frightening. Mark Mobius: The most important insights I think are gained from talking to people and observing how they are doing their business because we put a lot of emphasis on the people behind the business, what they’re doing and how they are working. And one of the great insights I had was when I was in Vietnam. We had been thinking of investing in a PVC pipe manufacturer. And we went to visit the factory with the managing director and part owner of the company, and I was really very impressed by the way he talked to the workers and how they genuinely liked him. They had a sort of fellowship together. That impressed me, and I realized that this company would be a very good company to invest in because you could tell that the workers were happy. They had a very good relationship with the owner and the managing director and that is a recipe for success in my view. What is the biggest surprise, positive or negative, that you have encountered during your travels? Mark Mobius: In Brazil, we had invested many years ago into a department store. From what we could see, everything was in order. We had been visiting the company every year. We sat down with the chief accountant—the man who handled all the finances of the company— and all of a sudden one year the company got into trouble and it was discovered that the major shareholders had stolen some of the assets and made off with some of the assets. And we went to the SEC [Securities and Exchange Commission] of Brazil, to, you know, find out what was happening and what they were doing about this. And it was about a year gone. We had been doing all this investigation, all this letter writing, contacts etc., etc. So then, finally, we went to visit the securities commission in Rio, and we asked for the director of the security commission. And the secretary said, “Okay.” And he fetched this director and who was it? It was the same accountant who had been the accountant of this department store. So he was now a member of the securities commission who is involved in the investigation. So this is one of the biggest shocks that we ever had. Thankfully, now, Brazil is going through a big revolution in terms of corruption investigations and getting their house in order in terms of trying to stop the corruption that has been going on in the country. So there has been improvement, but that was one of the big shocks of our life. Keith Damsell: A follow up question to that, perhaps one of the less-auspicious investments, maybe, that the firm made, but can you talk about, perhaps, a great success of an individual company you’ve worked with. Perhaps that you’ve seen grow over time from very small beginnings to a major organization? Mark Mobius: We were looking at a company involved in making gears. They were doing gears for all kinds of equipment. I visited the factory, and I noticed that they had a lot of very good automated equipment, a lot of robots, in China. This is near Shanghai. And I learned that they were going to be making gears for wind power. And I thought to myself, “Gee, this sounds like a good growth industry.” So, we invested. This was one of our private equity investments and then we decided to take it to the market and we listed that company in Hong Kong, and we made, I think, was about five times our money. You know an incredible return on the investment simply because people began to recognize that this company was doing quality work, and there would be a worldwide demand for their products. That’s probably one of the best investments we’ve made. Mark Mobius: I don’t have any regrets, but I would say: having not started earlier. I wish I had started in the investment arena earlier than that because I spent many years studying. Of course, it now stood me in good stead, but I would say that’s the biggest regret. I wish I had started earlier on this incredible career that I now have. Keith Damsell: Mark, this is a common question you get—always people interested to find out about the comic book that was published under your name. Can you talk a little bit about the comic book and how it how it came about? So when they asked me if, you know, I would cooperate in telling my life story for the comic book I said, “fine.” And the cartoonist, now, started to do some intensive research. I was amazed how much detail he gathered. He probably gathered more information about me than I knew about myself, and he did this comic book in Japanese. It was, you know in Japan they’re called “Manga” and there are adult comics as well as children’s comics. In fact, I think adult comics are probably bigger in Japan than children’s comics. But, they published and then, of course, it was translated into English, into German, into Arabic, into a number of other languages. So that’s the way it came about. It’s quite an exciting story. Keith Damsell: I understand another comic book from somebody on a different subject matter and crew you’re working with on compound interest is in the works. Can you talk a little bit about that project? Mark Mobius: I realized there is tremendous need for financial education in the US and other parts of the world. Most people are not really interested in the financial world. It’s boring for many people. So I thought, well why don’t we make it interesting and educational at the same time? So I decided that I’d get together with a group to do a comic—just for the fun of it. It’s about what is compound interest, but it’s done in a storybook type of setting. And it’s interesting because one of my young nephews is now reading it, and I know he was very interested. I’d like to get his comments when he’s finished. Keith Damsell: Well, thank you very much, Mark, for making the time. It’s always a pleasure to talk to you and I look forward to speaking again soon. Mark Mobius: Thank you, it’s a pleasure. Host/Richard Banks: Unfortunately, we’ve reached the end of this episode. But before we go, we’d like to leave you with something inspirational. Earlier, we asked Mark if he had any words of wisdom, any advice for someone trying to build their career. Mark Mobius: I think the key to anything is that you got to love what you’re doing. I mean, if you’re unhappy, you’re not really interested in what you’re doing—don’t do it. Get out and do something else. So you’ve got to love what you’re doing. That’s number one. Forget about the money. That will come. The main thing is to do what you really enjoy. The second thing is keep an open mind. Don’t make any conclusions until you have all the facts. Try to learn as much as you can and stay humble. Don’t try to draw conclusions based on your own opinions or your own biases. Be ready to accept new ideas. It’s very, very important. I’ll never forget, I was friendly with a former MIT guy who had started a consulting company doing packaging consulting, and he had on his desk a little metal plaque. He said there’s no limit for how far a man can go, as long as he doesn’t mind who gets the credit. I thought that was great because that really summarizes, you know, his success because he was quite a successful consultant. Host/Richard Banks: That’s it for now. If you’ve enjoyed Talking Markets with Franklin Templeton, you can hear more from us by subscribing on iTunes, GooglePlay, or just about any other major podcast provider. See you next time when we uncover more insights from our on-the-ground investment professionals. Until then, goodbye.